I love a stuffed chicken. It’s a great make ahead meal, and beautiful presentation. It takes a bit of practice to learn to remove the carcuss and bone out the whole chicken in order to stuff it. But once you master it, you can stuff it with sautéed mushrooms, spinach, ham, roast red peppers, artichoke hearts, cheese, sausage, etc… anything your imagination can conjure up. In this case, I followed a simple and different recipe of Nobu Matsuhisa (of Nobu fame), from his Nobu West book. It seemed an unusual, and simple, recipe for a sushi chef, so I was intrigued. Once you bone out the chicken (leaving the leg and wings in place… removing the carcuss and thigh bones, you can open up the chicken and season it with salt and pepper. Then fill it with shredded cabbage. That’s it… shredded cabbage. 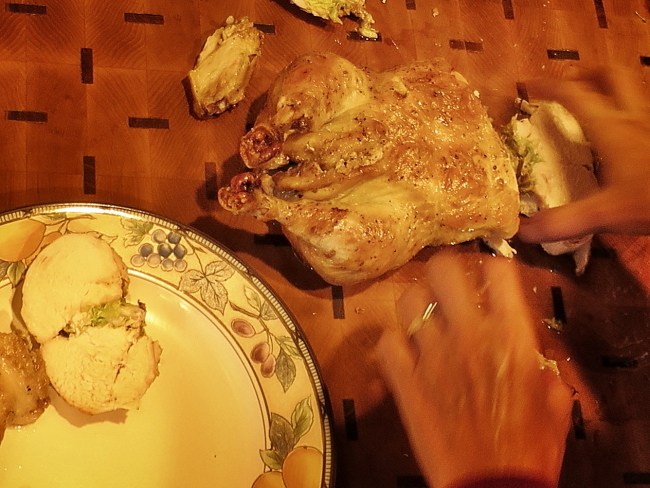 Then fold the chicken back together and truss it, to hold it all in place. You can do it with cornish hen, or chicken. I baked it 30 minutes breast side up… then, 30 minutes breast side down… then a final 20 – 30 minutes breast side up again (400F). I sliced the chicken into boneless medallions and served with a spicy lemon dressing. It was juicy deliciousness. 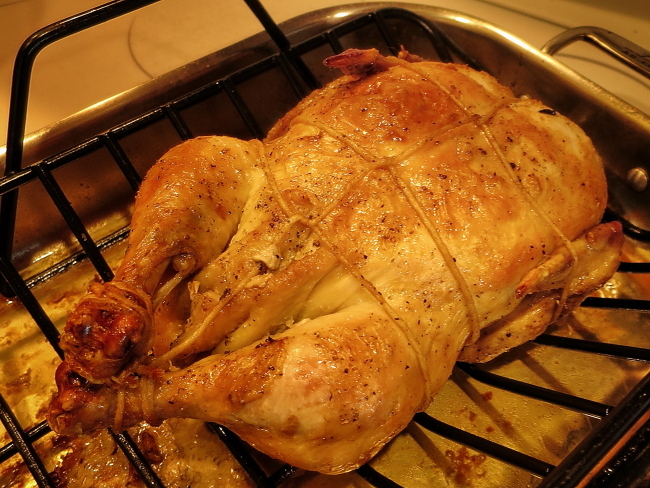 If you don’t want to bother boning out a chicken… or stuffing it. Just roast it in the oven whole…. do my flip-flip method… 30 minutes breast side up, 30 minutes breast side down, 20 – 30 minutes breast side up.. until skin is crisped. Allow to rest briefly and cut up and serve with the dressing. This dressing recipe is great on anything. Put it in a jar, shake it up and serve over chicken, fish, salad… or anything.